My happy place exists where food and design meet, so when I was given the opportunity to go to the Winter Fancy Food Show it was like being given a ticket to Disneyland. 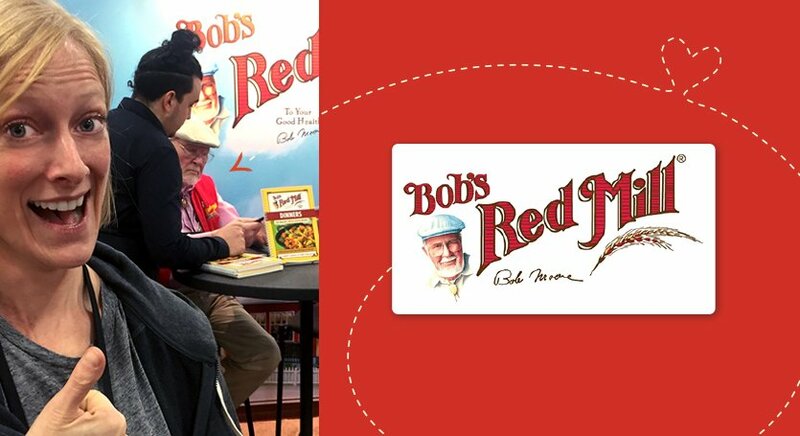 I even got my picture taken with the Fancy Food equivalent of Cinderella: Bob Moore, from Bob’s Red Mill. Granted, he was on the phone doing business when I walked by, but I still captured the moment where I saw one of my food heroes in person. There was so much variety, creativity and innovation at the show, but some trends did come to the forefront. I have compiled 5 trends from this year’s Winter Show and sprinkled in a few of my favorite product discoveries. Apple Cider Vinegar was everywhere and I was 100% on board with this trend. It seemed like every other booth had a tart, vinegary concoction to sample. After eating an array of diverse foods, we all undoubtedly benefitted from a little probiotic love in our tummies. I discovered that many Fancy Food veterans come armed with Tums or Pepto Bismol. As an unprepared newbie, I was thankful that I came to the show when apple cider vinegar was having its moment. After eating duck salami, green tea mochi, white chocolate covered seaweed, spicy dried fava beans and a shot of cilantro lime salad dressing, I was happy to have these little health tonics handed to me at every turn. 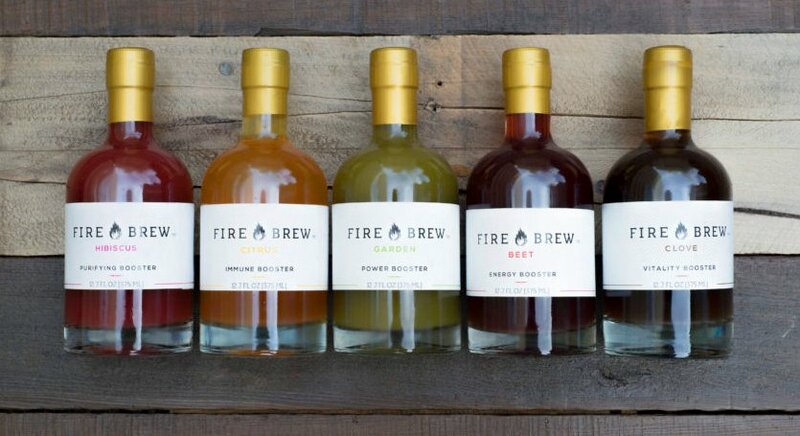 Firebrew from Portland, Oregon, was my favorite vinegar based product line. Beautiful, simple packaging with a powerful product inside. I’d highly recommend reading up on the health benefits of these potent elixirs. The innovative use of plants, veggies and fruits was truly inspiring. Specialty food producers are listening and responding to growing health and environmental concerns. Bee Free Honee was one of my favorite discoveries from the show. This product definitely falls into the ‘Design for Good’ sector. Bee Free Honee is made from apples and it tastes very similar to honey. Why bother, you ask? Sadly, bees are in danger and we need to look into ways to protect them.In October 2016, the bumblebee was put on the endangered species list. And acccording to NPR.org, 75 percent of food crops rely at least partially on pollinators like bumblebees, which raises serious concerns about the future of the global food supply. To all people who eat, this is a BIG red flag and we need to pay attention. 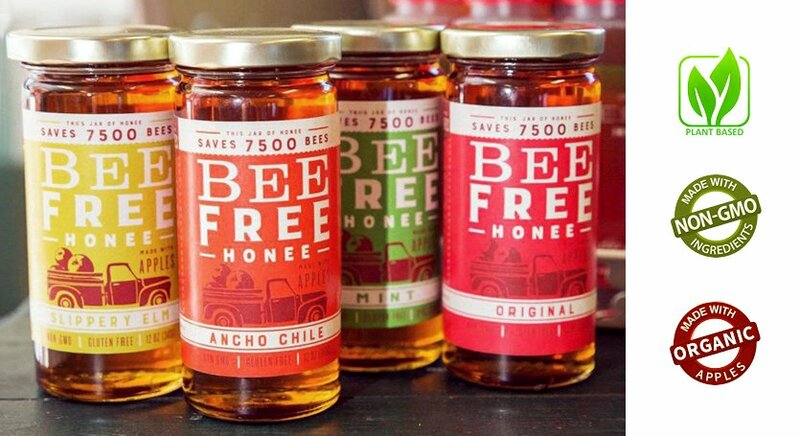 Creator of Bee Free Honee, Katie Sanchez, said it so simply, “We can live without honey. We can’t live without bees.” So she and co-owner Melissa Elms created a product that provides our tastebuds with the honey taste we love and also acts as a vehicle for awareness. Let me tell you: awareness is delicious. I know, I tasted it at the Fancy Food Show. As a designer, convenience and experience will be my mantras for 2017. People are busy and want things fast and easy. If you can provide a high quality, memorable experience while doing that, you’ll be on your way to the sweet spot of brand loyalty. 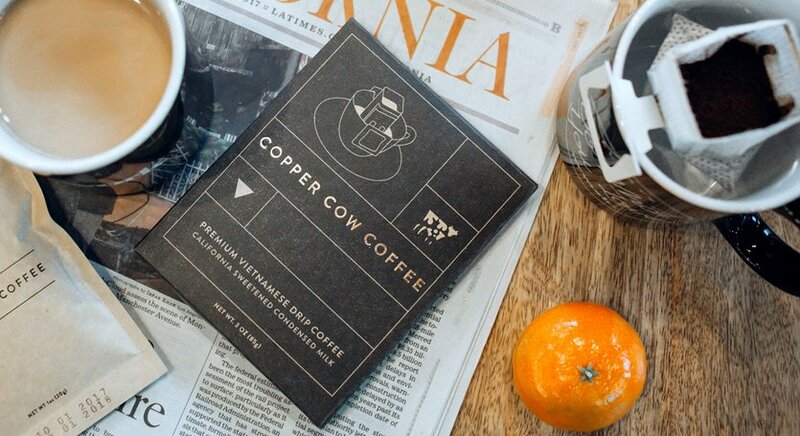 Copper Cow Coffee has done this with their portable Vietnamese coffee kit. The beautifully designed box contains a packet of coffee grounds, a small tube of sweetened condensed milk, a portable coffee filter that grips the side of your mug and a stir stick. Just add hot water and stir. While chatting with the creators, they asked me this: “Imagine if you were camping and you could make this on a chilly night.” While this is a lovely idea, truth be told, I’d really love a Copper Cow Coffee kit waiting for me in an AirBnB or hotel room. But for you outdoorsy folk, go for it! This is a well designed little luxury and a great gift idea. Many companies are being more cognizant and transparent about the sugar content in their products. Words that I heard repeatedly at the Fancy Food Show were unsweetened, no sugar, low sugar, no added sugars, sugar-free etc. So the sweet stuff is definitely on everyone’s radar. Factors driving this trend are increased health concerns as well as new FDA labeling regulations requiring added sugars to be called out as a separate line item. People are becoming more aware and interested in what’s going into their food and the new regulations will hold product manufacturers more accountable. 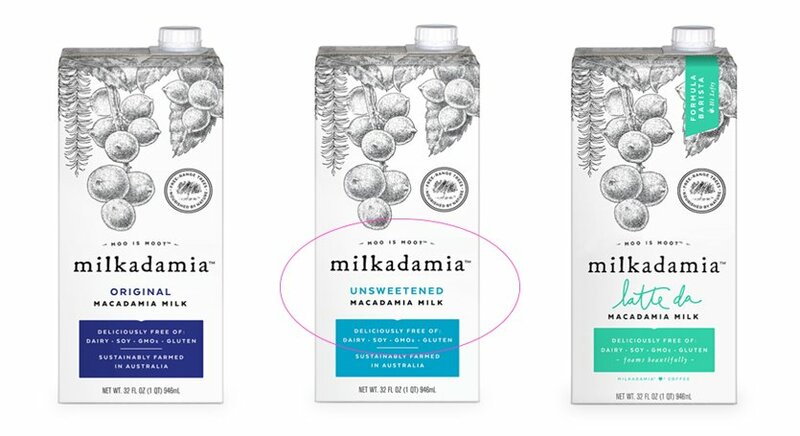 One of the most delicious new sugar-free products I tried was unsweetened macadamia milk from Milkadamia. It’s naturally sweet with an amazing flavor. Compared to whole milk, this macadamia milk has less calories, less fat and more calcium per serving. Plus, it’s plant based, sustainably farmed and comes in beautifully designed recyclable package. Milkadamia, I am your new brand champion in Kansas City. I’ll be chatting with local grocery stores until I see this lovely product show up on shelves. Until then, I’ll see you on Amazon. The word craft is becoming so prevalent in specialty food-speak that sometimes I fear it’s losing the depth of its meaning. But then I meet someone like Domantus Uzpalis and I’m reminded of the true definition. Domantus is the Lithuanian chocolatier behind the brand Chocolate Naive. The conversation that my FFS partner in crime, Gaby, and I had with him was unlike any other at the show. Instead of reeling off a rehearsed sales pitch or a list of product highlights, he led us through an experience that was humble, authentic and inspirational. Gaby and I were first drawn to the packaging. 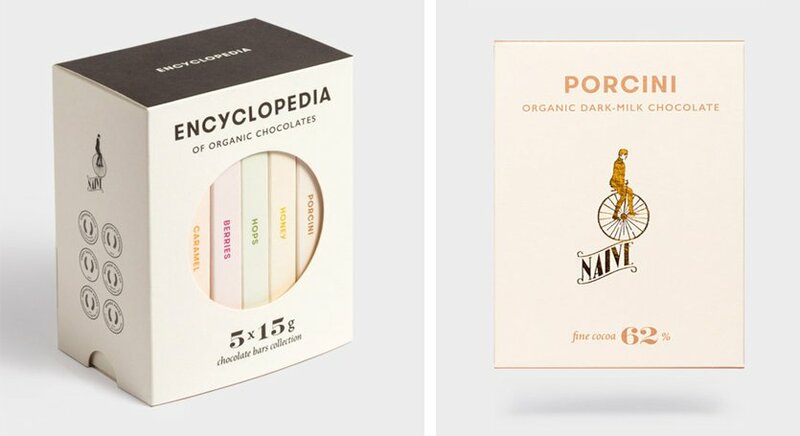 It looked like a collection of little modern art books, which really stood out among the rows and rows of chocolate. Domantus then explained to us that each bar has its own story and let us taste his chocolate as we listened to the story behind each bar. My favorite was the bar that had porcini mushrooms in it. It was fragrant, earthy and creamy. He created it to remind him of mushroom growing season in Lithuania. Apparently, Lithuanians love their mushrooms and if they find a good spot where they grow, they keep it a secret. They consider the porcini to be the king of mushrooms, so in tasting this bar, it felt like he was sharing his own prized stash with us. We got a sneak peek at a line of chocolates that have not been released yet. He experiments with flavors like Amazon fruit, tahini and dark pollen. I have one sitting on my desk and it feels so precious that I only want to open it every five seconds. Gaby and I both walked away from that booth speechless, with big smiles and looks of happy disbelief. Domantus was the diamond in the rough at the Fancy Food Show and we found him. All and all we had a delightful time wandering from booth to booth immersed in food, drink and design. We left with full tummies and heads spinning with possibilities. As designers, we are constantly invigorated by the world around us and this was an abundance of appetizing inspiration. Women vs. Men: Who's on Top in the Design Profession?